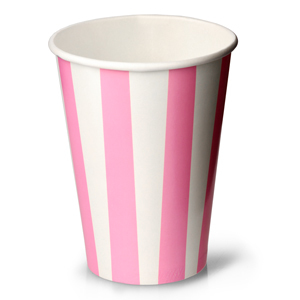 The Pink Striped Milkshake Paper Cups are the retro inspired way to serve drinks or snacks. With a polyethylene coating to improve strength and durability, these milkshake cups are perfect for fast food restaurants or cinemas. Ideal for serving fresh milkshake, smoothie, popcorn or pick n mix, these stripy paper cups are even certified as fully recyclable. With a disposable design, these retro cups provide an ever popular vintage theme to your drinks service. "Always a fabulous cup to use for cocktail presentation."